Wow your family and friends with delicious home made, healthy cakes that are raw, vegan, gluten/wheat/dairy and refined sugar free. As the world becomes more health conscious, many of us are steering away from gluten and wheat products. Raw cakes are becoming more and more popular as the “alternate” birthday or wedding cake. However it always shocks me that most people think raw cakes are really hard to make. I get it, we’ve all been to that cafe and ordered that raw cake that was too sweet, too heavy, too gooey (or dry) where the flavours are just over the top. That’s why this class is about educating you on the fundamental core ingredients so you can better understand how they work together in various ways to create different results. This class is perfect for absolute beginners and avid bakers alike. Raw cake making and decorating – made easy! Learn which ingredients can replace the classic flour, butter and sugar in traditional baking and why. There’s so much to choose on the market but only a few of them will make your raw cake moist and consistent. Don’t waste money on buying expensive equipment you’ll only use once. I’ll cover the essential equipment needed for raw “baking” — with plenty of price options included. I’ll teach you how to make delicious raw jams that can be used as accompaniments and layers in your desserts. When people cut through your cake they’ll be impressed by the complexity of the layers. Add crunch, flavour and texture your raw cakes by adding candied nuts, seeds and coconut. Not only do they work as beautiful garnishes but adding texture makes your cakes addictively moreish. In terms of cake vanity, it’s all about the frosting! I’ll go through different nut and nut-free based frostings and icings. From a decorating perspective, there are pros and cons to both. I’ll teach you how to get the consistency right. Making a raw cake for a special occasion? I’ll show you how enrobing (dipping) items in chocolate can be a wonderfully impressive way to garnish your cakes … or make them as stand alone desserts. Save a load of money by creating your own stunning cakes for special occasions. Learn the do’s and don’ts of raw cake making to avoid simple mistakes at home. Meet and mingle with like minded people having conversations that captivate, inform and inspire you towards great health. Because most of us are practical learners, my classes are as hands on as possible, about 60%. I will work through the basics of raw cake making, so you understand how the ingredients work (and don’t work) and what proportions you should use (this is essential!). If you’re an absolute beginner, you will leave the class equipped with several base recipes that will act as a starting point for dozens of cakes. You’ll be able to mix and match cakes with icings, make them into single or multi layered cakes and add unique, delicious garnishes to make them pop visually and add complexity of flavour to each bite. If you’ve been experimenting with raw desserts and cakes for a while and want to get some practical advice and troubleshoot any issues you’ve had in the past, this class will give you the opportunity to get all your questions answered and get you hands on with the new techniques in class so you can start building your cupboard with the right ingredients and tools to get going once you’re home. On the day we will make 3 cakes using different techniques in each one such as multi-layer cake, birthday cake, fermented cheesecake and a decorative cake ( like the checkerboard cake pictured on this page). All cakes will be decorated on the outside using a range of techniques and you’ll take home (or enjoy in class) a piece of each cake. To make sure you remember it all at home, upon booking your space, you’ll be sent a pdf of the class book with all recipes and techniques you’ll learn on the day. 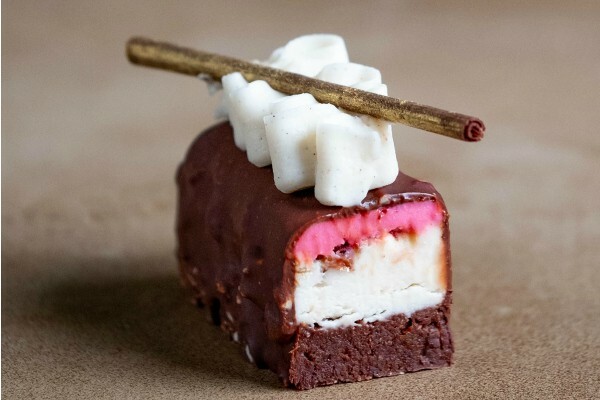 Your course is not just an introduction to raw cake making, but also to a community of passionate raw chocolatiers which will support you long after the course is completed. After the class, I encourage my students to stay connected. It’s a wonderful way to stay inspired and see what others are making and get new ideas. 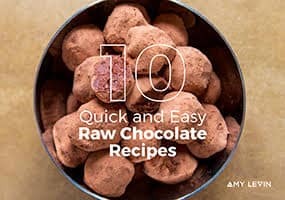 By taking the class, you will be invited to join my private “Raw Cakes Masterclass” Facebook group; a community for my students, many of whom have gone on to create chocolate commercially. You can post questions or comments here, and in time help others too! Just kidding, there isn’t any. However, to get the most out of the class I suggest you research “raw food”, “raw crackers”, “raw cakes” online or buying some basic raw food books so that you are familiar with basic methods of raw preparation including using a high speed blender, dehydrator and soaking and sprouting nuts and seeds. This will help you to understand some of the content of the class better, but this is definitely not essential as all questions that arise during the class will be addressed there and then. You will be given a code (good for a lifetime), giving you the course for 40% off the normal price. This means that you will have items from the class, and much more, at your finger tips forever. So, if you forget something from the class, you will have the online videos to refer to, amazing! I've never made raw cakes before, is this class suitable for me? Absolutely! All my classes are suited to beginners and more advanced students alike. This class will teach you which ingredients to use and how to combine them for the best results. What equipment do I need at home to make the cakes from this class? In an ideal world, you’d have a Vitamix ( or other high speed blender with a tamper stick ) and a food processor. However, a Nutri bullet and a mini food processor will do the trick for starting out. You can then upgrade down the line if you’d like to. I have a nut allergy, is this class suitable? Yes! We do use nuts in the class, but there are recipes in the class book that are nut free ( cake bases and frostings alike ). If you are highly allergic, you might consider booking a private class with me so we can focus on using only ingredients that suit you.